This is about as complicated as it gets. I haven’t washed my face in 6 years. If you’re now picturing me as a dirt-smudged ragamuffin, hear me out. As a teenager, I never had particularly bad acne, but I usually had a smattering of zits on my forehead and chin. I never wore much makeup beyond concealer and a little eyeliner and mascara, so it’s not like my pores were clogged with foundation or anything. I did, however, need to use those miraculous blue oil wipes constantly. Most photos of me from that age make me seem like I rubbed butter all over my face. I was SHINY, yo. I washed my face once or twice a day, and I bounced from cleanser to cleanser every few months. Clean & Clear was the first, followed by several natural brands. But I was never happy with the results. My skin would feel squeaky clean and soft after I washed it, but sure enough, just a few hours later, I’d be Ms. Butterface again. At the age of 21, I’d had enough. I searched the bathroom for my roommate’s facial cleanser. 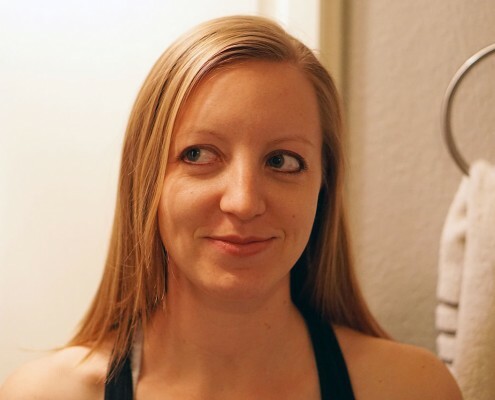 This girl had skin like Mischa Barton in a Neutrogena commercial, and I wanted to know her secret. An expensive Aveda variety, perhaps? Or a top shelf Sephora? But my bathroom search yielded no results. So I asked her about it. Her response? I never wash my face. Wha-huh? How could that be true? The skin care industry had me believing my face would wrinkle and fall off without its help! But balancing antioxidant facial cleansers! But pore-shrinking exfoliation masks! Oil-free Moisturizer! I threw all of it under the cabinet and decided to follow in my angel-faced roommate’s footsteps for a few days. Just as an experiment. I don’t remember if my skin got worse before it got better, but it must not have been a traumatic experiment if I can’t recall. All I know is that shortly thereafter, I stopped needing the blue oil wipes. I stopped getting zits. And then my face fell off. Just kidding. It got a lot better. And I never looked back. No zits today! Or yesterday. Or tomorrow, probably. 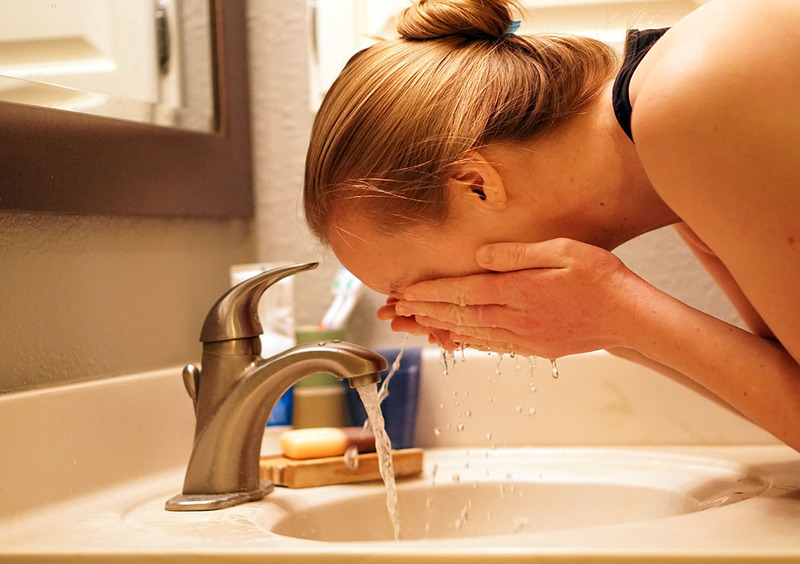 I DO splash cold water on my face sometimes in the morning or before I go to bed, but even that is not a daily occurrence. I don’t even take off my eyeliner or mascara before bed (I do use 100% Pure’s fruit pigmented makeup). I still get the VERY occasional zit on my jawline, but I think those zits are more directly correlated with dietary slip-ups and stress than anything else. I’m now convinced that expensive skin care products are the biggest scams and money wasters in the health & beauty industry. If you have severe acne, eczema or other skin issues on your face, I totally understand that leaving your skin entirely alone might be out of the question. In that case, I do hope you are pursuing additional treatments beyond just daily washing and moisturizing. However, for most of the population, I strongly believe even the most basic facial cleanser is unnecessary. Here’s the thing: if you’re like most people, all you need to do is let your skin renormalize its oil production. Every day, I had been washing away my natural oils. Then my skin would overcompensate and produce too much oil–hence the vicious Butterface cycle. Once I stopped aggravating the oil production, my skin could finally balance itself out. One caveat: your diet must already be rich in nutrients and good fats for this whole no-washing thing to work. Having hand eczema has taught me that topical treatments are Band-Aids at best, and symptom aggressors at worst. The state of your skin signals what’s going on internally. You need to heal internally if you want to see improvement externally. The same can be said for anti-aging facial products. What you consume and the lifestyle you choose has far more bearing on wrinkles and skin elasticity than any eye cream. If your diet checks out, you may find that your body already has everything it needs to clear up your skin. Get out of your own way and stop trying to fix something that can fix itself. Have you joined the No Face Wash club? How have you seen your skin change?